The first question you may have is: What is a lapel? A lapel is the collar of a coat or jacket. 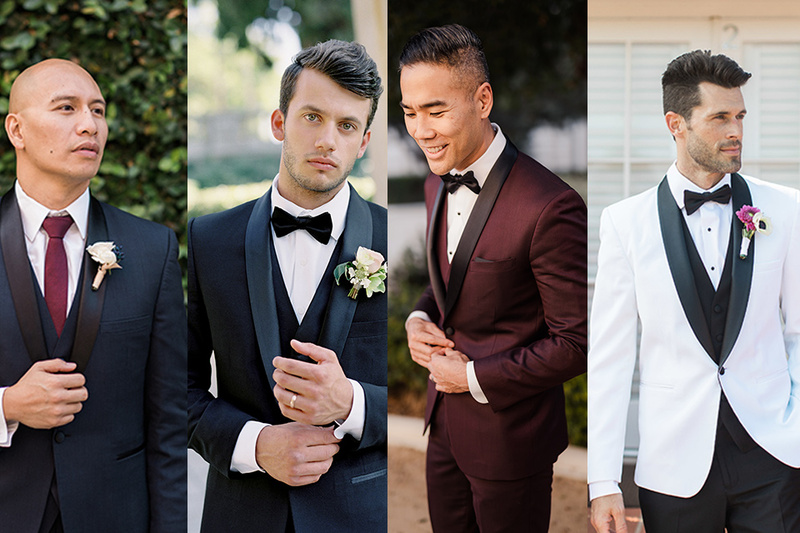 There are three main types of lapels including a notch lapel (most common for suits), a peak lapel (used in both suits and tuxedos) and a shawl lapel used almost exclusively for tuxedos). 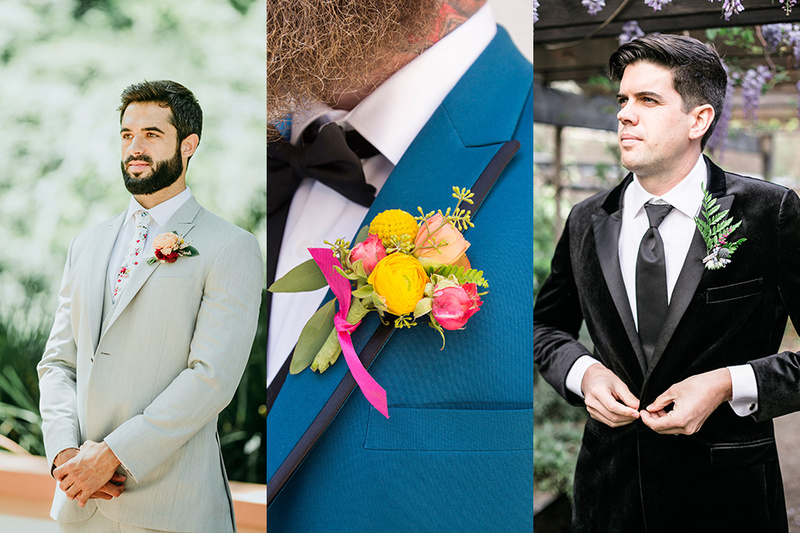 In this blog we are going in depth with examples about lapels and other suiting designs. 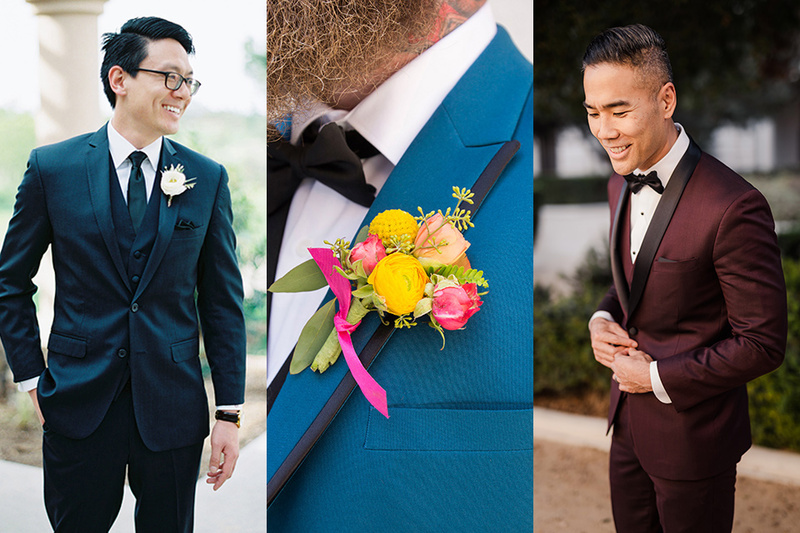 There are plenty of details to consider when it comes to picking out a suit or tuxedo: fit, color, threading, pockets, lapel, buttons…all of it can get a bit daunting if you do not know what you are really looking at. So, we are here to help. With this article we are going to start at the top with explaining the different lapel styles to consider when looking at your jacket. In the most basic terms: the lapel is the foldy flappy thingy by the neck of your jacket. Yes, we know that does not seem like the most sophisticated definition, but you got what we were talking about, right? The collar of the coat. Your lapel says a lot about your personal style, and the overall theme of what you are going for in your attire. There are many types of lapel styles and here we are going to cover the basics: notch, shawl, peak, and detailed. Many of these can overlap each other, but do not worry we will break that down in more in depth so it is simple and easy to understand. This is the common of all the lapels, now remember common or traditional does not mean boring and simple. It is the most common lapel because it just works, always. The definition of this style is: when the bottom of the collar and the top of the lapel connect at a 75-90 degree angle. This makes it sound way too complicated. If you look at the lapel you can see that it looks like someone has taken a simple piece of the jacket off and it created a v-like incision. That is what makes it a notch. This style is great for blazers, sportscoats, suits, and tuxedos. You can wear a jacket like this to a wedding, interview, or a black-tie event. This style is more fashion forward and for those who are willing to bring more of a flare to your attire. This lapel is defined by the edges pointing upwards toward your shoulders, an easy way to remember this style is by imagining the lapel as a mountain peak- at least that is what works for us. This style will definitely make you stand out among the crowd, but it is up to you how much you want it to. Take our light grey suit by Ike Behar, it’s simple color that is light and airy. The lapels being the same fabric as the suit and allows the lapel to just be a small detail. Where our velvet or teal coat has a shine or detail to it that makes the lapel stand out in a bold way. Now this one is different than the rest because instead of the jacket having an edge or a piece taken out of it, the lapel simply just goes all the way around. Imagine a scarf or a “shawl” around your neck for warmth, you wouldn’t want a hole or edge in your scarf right? How pointless would that be! Well, that is what a shawl lapel does. It just goes all the way around your neck smoothly, no notches and no peaks. For the most part this look is mostly attached to tuxedos, but on rare occasions it can be done with a sport coat. Regardless what you are wearing this to, you will look the most sophisticated and dapper. Now when you look at the three lapels mentioned above you can see that there are small details and variations even between them. There are many kinds of details but these below are the most used. 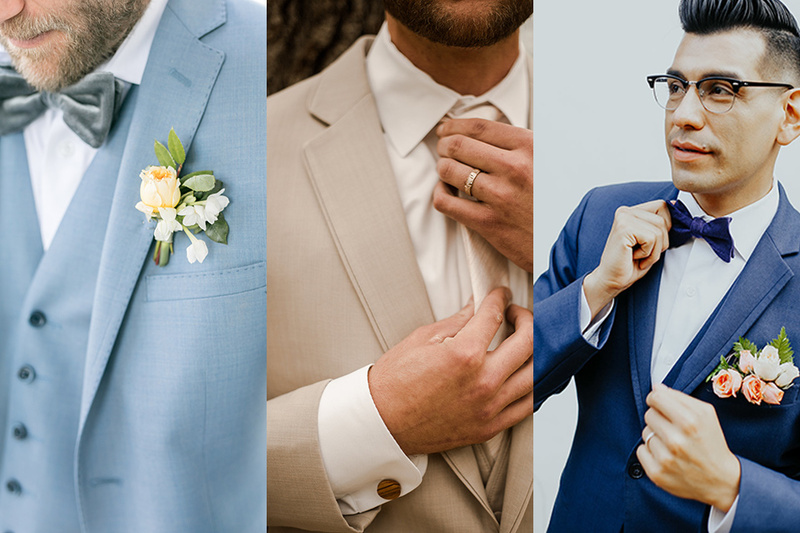 If you look at the light blue suit, you can see a faint border along the lapel, this is called a “pick-stitch.” While the other two are considered “framed” lapel. You can have the framed lapel be in the same color and texture as your suit like in these two pictures, or you can have it in a contrasting color like in the teal coat mentioned in the peak lapel section. 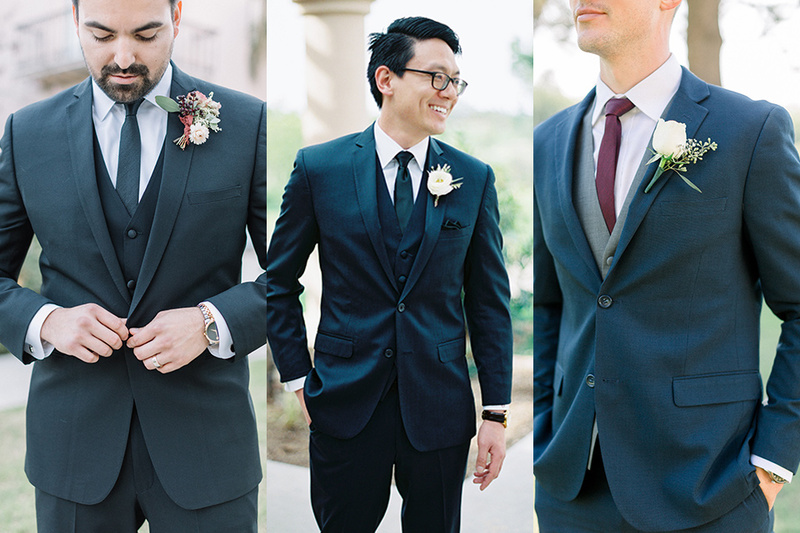 Hope this review of suit and tuxedo lapels changed your life! We'd love to help with all your menswear questions so chat with us, call us, or pop in to one of our stores to work with a Stylist in person. If you have an upcoming wedding, we make style appointments for brides and grooms to meet with us in-store. Register your event for free to take advantage of wedding & group discounts.